Oriental Mindoro, Philippines- If you heard me right, yeah, there’s only one name will ring the bell when you do. What is it? PUERTO GALERA. A natural heaven for scuba divers, snorkelers, and travellers. Puerto Galera is a lot more quiet than Boracay Island and quite cheaper. We had $30 USD triple room with private bathroom, cable tv, fridge and balcony, but it wasn’t a good located guesthouse. I was told that you could bargain it down if you will stay longer, and they mean unbelievable bargain, if you want to stay longer. Food ranges around $3-5 USD per meal. There are several stuff to have fun here, snorkeling costs USD $40, at 9am, a boat man would take you to a great spot with his boat and let you stay there for as long as you want and snorkel. There are few smallboat men waiting there, pay 100 pesos ($2 USD) and they will pull you slowly around the great place to snorkel, and that’s amazing! Awesome coral reefs and sea creatures! 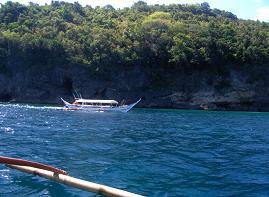 After snorkeling, they would let you do island hopping on different great islands along the way going back. You just don’t want to start the day too late, it’s better to have more time and not rushing overseeing the nature. Overall, Puerto Galera is ann adventure! It took us 4 hours from Manila to Batangas Pier a bus fare costs $4 USD per person, 6 hours to Batangas Pier to Puerto Galera on a RORO ferryboat costs $5 USD per person. We came there past dinner time so we just hang out the shore, walk around and prepared for the another adventure the next day.